Earns The Top Spot For The Second Straight Year. 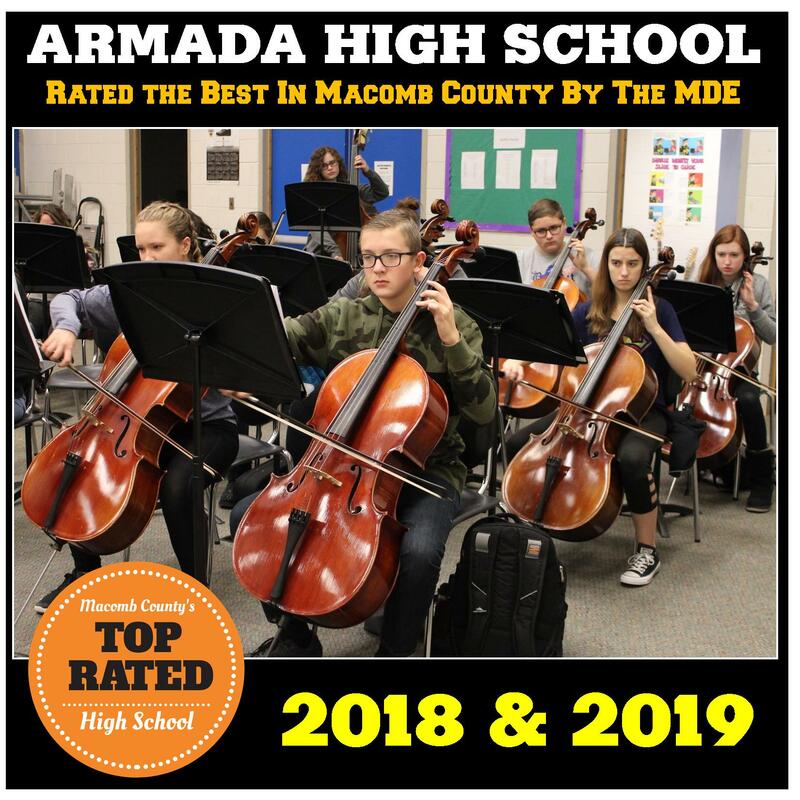 For the second year in a row, Armada High School has been named the top comprehensive high school in Macomb County as identified by the Michigan Department of Education. The rating is based on seven factors, student growth, student proficiency, graduation rate, school quality, assessment participation, student support, and English Learner progress. Ratings are based on data from the previous school year, so 2019’s rating is based on the 20187-18 school year. Armada High School increased its score in 2019 to 96.93 out of 100 from 94.13 in 2018. It also extended its lead over the competition from one point over second place Utica Eisenhower in 2018 to five points over Merritt Academy and more than twelve points over the next traditional public school, Utica Henry Ford II. Comprehensive high schools are buildings that offer a full complement of programs including special education, athletics, and career and technical education programs and include charter and traditional public schools. Now more than ever, there is no better place for students to learn and grow in the region than Armada High School. For more information go to www.mischooldata.org. 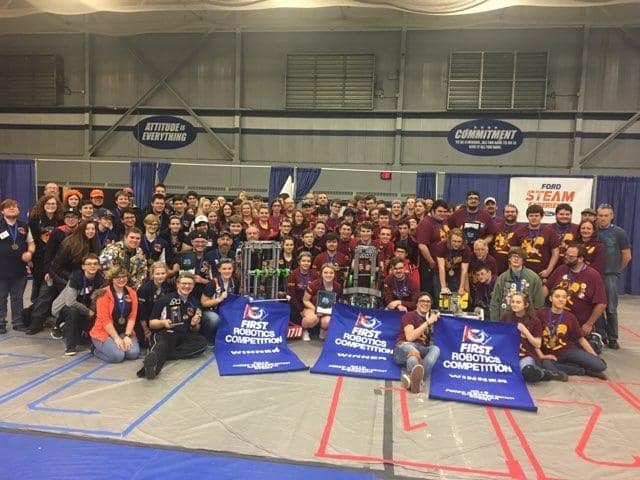 The Fighting Pi won the Gibraltar District Event on March 2, 2019 with an 11 win 1 loss record in qualification matches and swept through the playoffs 6-0. This was their 1st win since 2016. 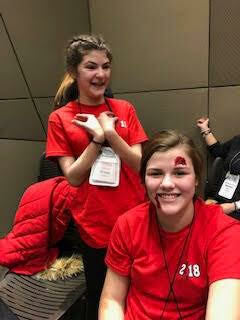 The team also won the Entrepreneurship Award and Paige Drob won the Dean’s List Award – she will now compete at the State Championship to try and become one of 15 state finalists for the award. With the win, the team is well on its way to earning a spot in the state and national championships. Payton Miller impressed the judges with her performances as she sang two pieces: "Danza, Danza, Fanciulla Gentile" and "The Little Horses". 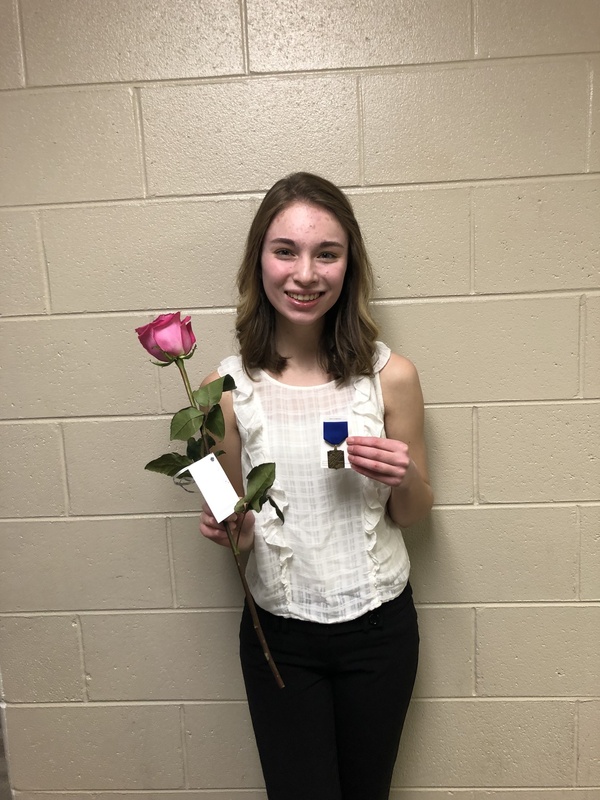 She earned the highest rating of a "One/Excellent" and will go on to compete at the State Solo & Ensemble Festival in April. A recent social media challenge targeting children and young adults called the “Momo Challenge,” has created concern throughout the country due to its disturbing nature. The purpose of this letter is to make you aware of this challenge, provide you with information about it, and urge you to monitor your children’s use of social media and the Internet. The “Momo Challenge,” a game found on Facebook, YouTube, Kids Tube, WhatsApp, and various other games and apps features a frightening avatar who asks its viewers to perform various tasks and provide photos as proof. The "Momo" threatens those who do not perform the tasks. Please be vigilant in monitoring your child’s social media and internet interactions. We send this letter with caution because talking about the Challenge can cause alarm and fear in more students than those actually exposed. However, because many students are aware and discussing this at school, we wanted to address the issue. It's important that children know that they should not be trying to contact strangers online, regardless of the method. Setting privacy systems on devices with your child is a great way to have this conversation and agree on automatic precautions. Fostering an atmosphere of openness and transparency about online activity ensures that children can thrive. Please use this as an opportunity to remind your children not to accept any communication or request from an unknown phone number, link or app without talking to you first. If someone responds to Momo in a messaging app, then the hackers behind Momo can access your child’s device and use their contacts and personal information to continue to threaten and scare children. The Momo Challenge is a form of cyberbullying and we must all work together to keep our children safe. Here are some things we can do and resources to help you have conversations with your children. ● Monitor your child’s social media. Know their usernames and passwords. ● Be present when your children are online. ● If you do notice them switching screens on their devices when approached or new numbers or email addresses on their devices it's worth checking in with them. ● Talk regularly with your child and monitor their online use. ● Set up parental controls but know that you can’t always rely on it to block harmful material. ● Turn off suggested auto play on videos to stop children from viewing content they have not selected and you have not approved. 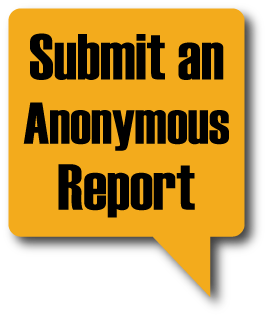 ● Report and block material you deem inappropriate or harmful to the social media platform. ● Educate yourself on how children are using social media and the threats associated with it. Armada's Program is the only district-wide program to earn the designation in Macomb County. 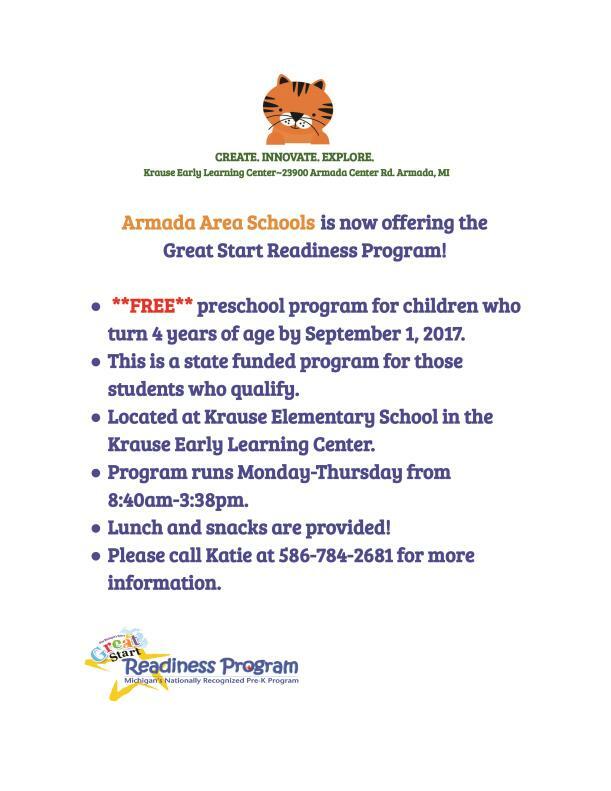 Armada’s Krause Early Learning Center has worked incredibly hard over the last few years to offer more programs and opportunities for our students. 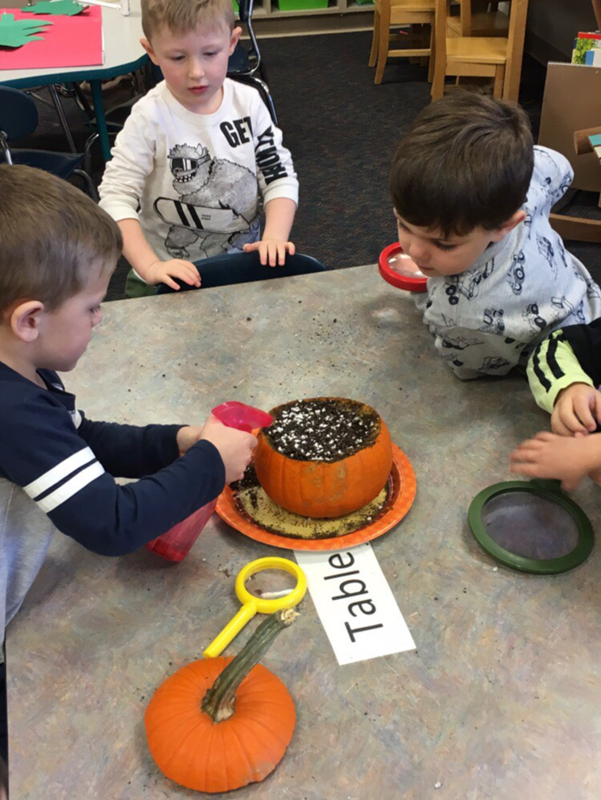 Our preschool teachers and aides have added new curriculum components, sought training, and revamped several practices to ensure our youngest learners get off to the best start possible. This work has paid off as the Early Learning Center has been recognized by the state of Michigan with the highest rating - a fantastic 5 Star Rating! If you have little ones that are preschool age, there is no better place to start than Krause Elementary’s Early Learning Center. 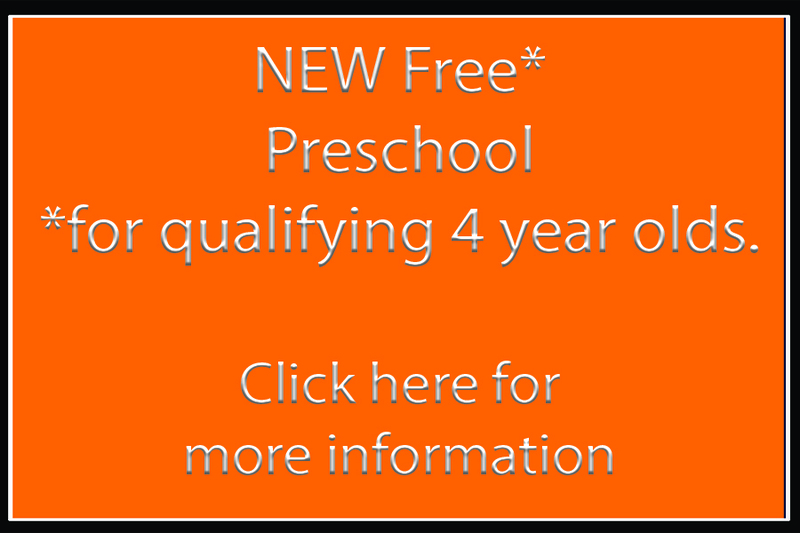 This is Macomb County’s ONLY 5-Star Rated Preschool! There are only 185 preschool programs in the state that have attained the 5-star rating. We are in the top 5% of preschool programs in the state. In order to achieve this rating, programs must follow the Department of Education Early Childhood Standards of Quality for Pre-Kindergarten. No other district in Macomb County has earned a district-wide 5-star rating. The Armada Area Schools is proud to announce that it has earned the distinction of making the national Advanced Placement Honor Roll for 2019. Armada was one of only 373 district nationwide and the only Macomb County High School to earn this honor. 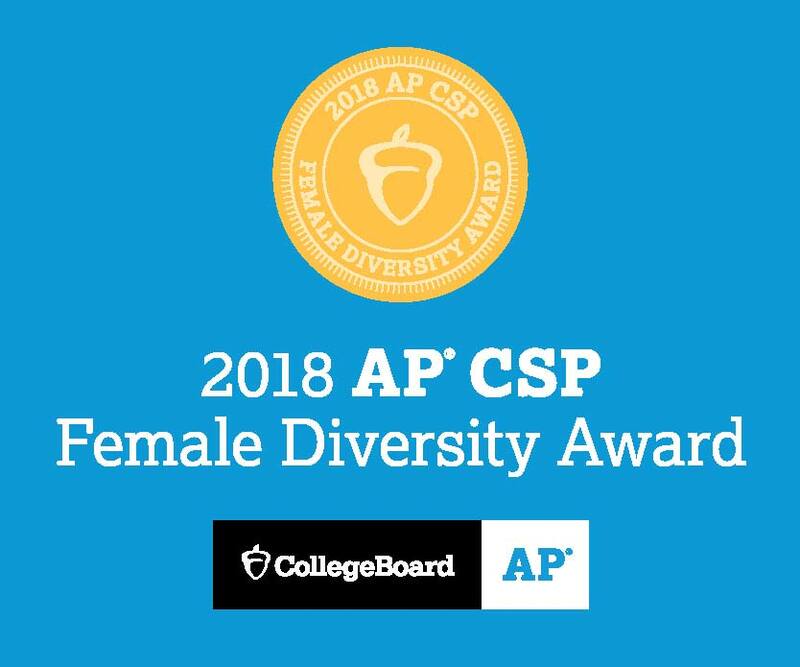 Last year Armada High School had over 300 AP Exams administered to its students and over 64% of these exams resulted in college credit for students. This resulted in families saving approximately $1.4 million in tuition costs. 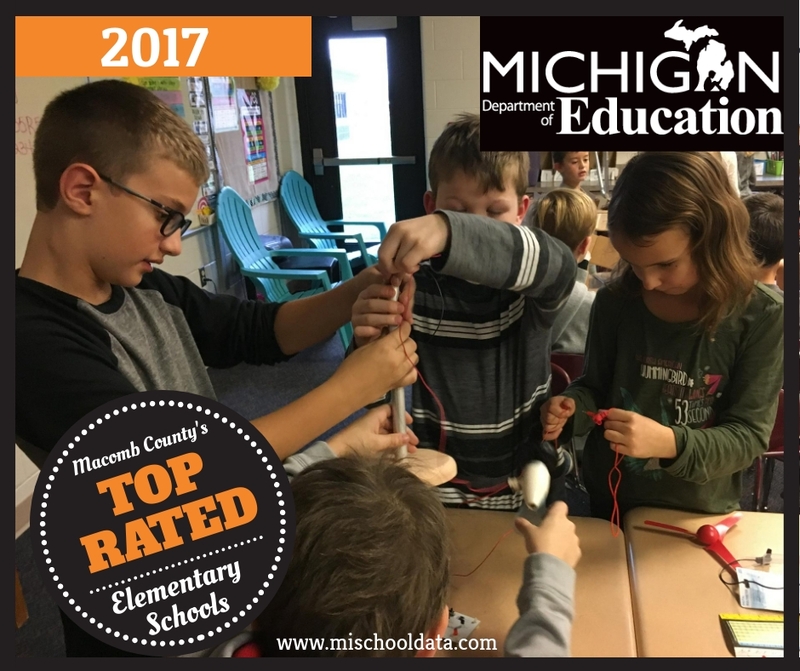 This is another reason that Armada has become the top-rated district in Macomb County and the school district of choice for over 500 students. 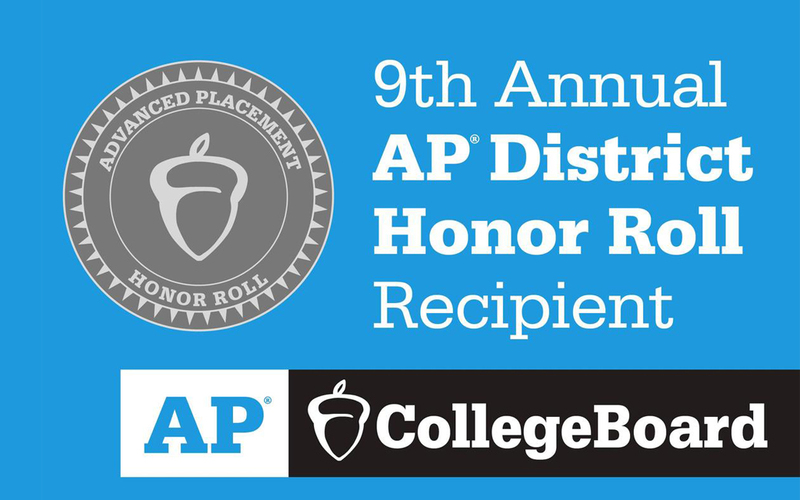 More information can be found at https://apcentral.collegeboard.org/pdf/ap-district-honor-roll-9th-annual.pdf . Since its inception, our thespian troupe has attended six state festivals and over the six has won: 54 excellent awards, 41 superior awards and students have received $1,189,600 in scholarship offers. On November 15, 2018, the entire Armada staff at each building was trained in the ALICE safety protocol by ALICE certified trainers. This training was borne out of ideas shared at our community safety meetings we held last year. This training is important to maintaining our committment to the community to keep our students as safe as possible while in our care. A second follow-up training will be held in the spring as well. If you have any questions about the ALICE training, please contact your child's building principal or contact the superintendent's office. 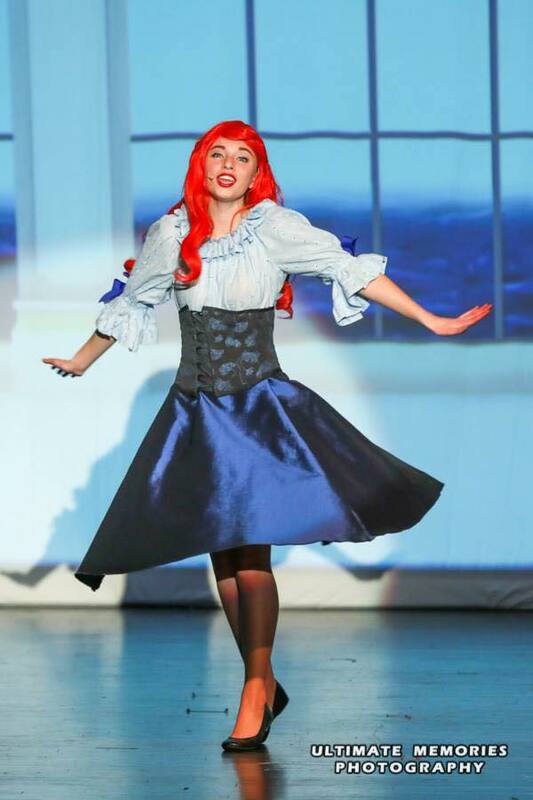 Little Mermaid Is A Whale Of A Hit! 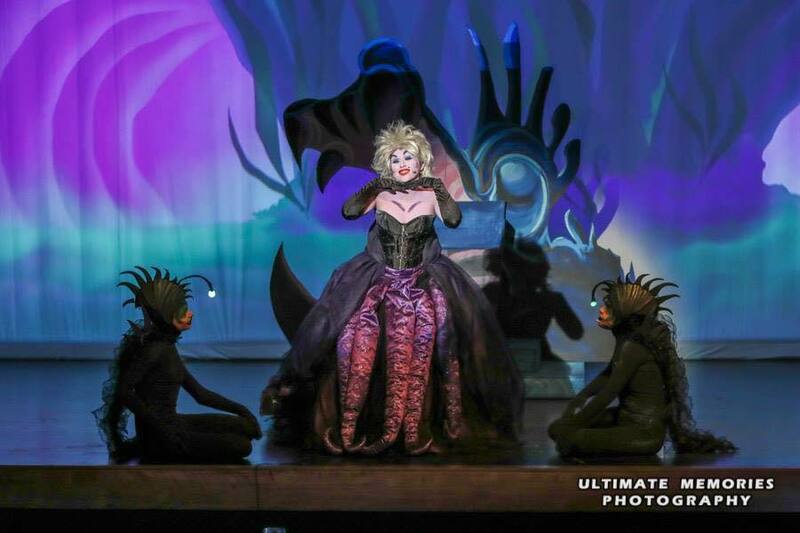 The fall musical The Little Mermaid was one of the biggest hits in the history of Armada Theatre. It sold out all four of its showings and included over 110 of our students in various roles both on stage and behind the scenes. 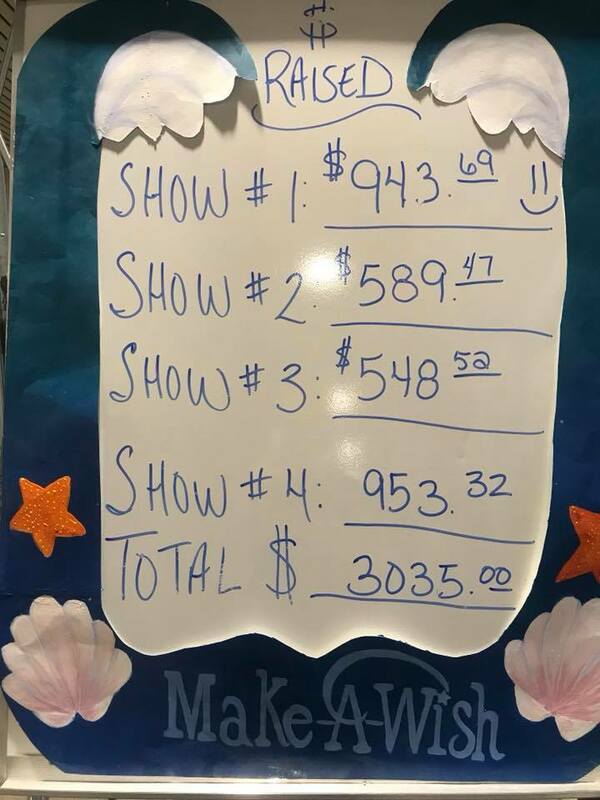 A huge thank you goes out to our audience which was able to raise over $3,000 for the Make-A-Wish foundation through our minute-to-give-it fundraiser before each show. 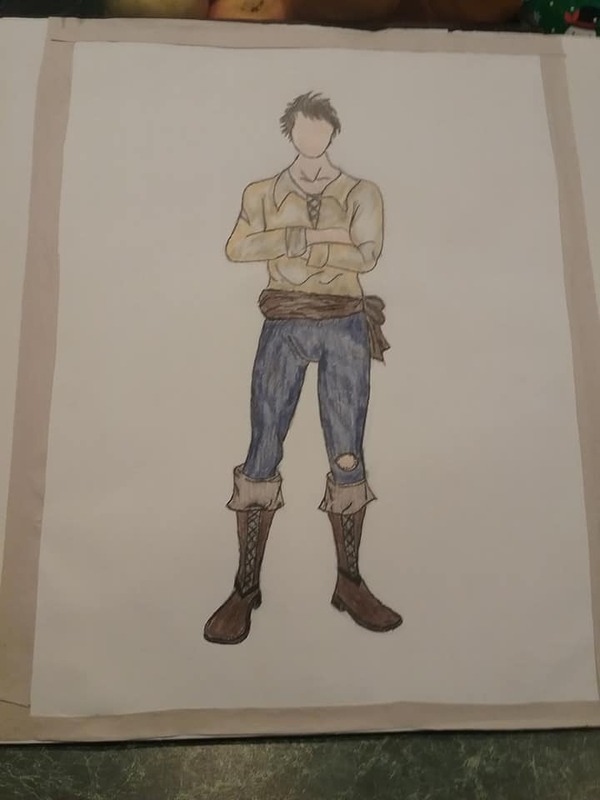 An exceptional job was done by Theatre Director Robin Caporuscio, her students, and all of our volunteers who helped make the show one of the best yet. The Michigan State Police (MSP) today announced that 114 public school districts, 42 non-public schools, 22 public charter schools, and 10 Intermediate School Districts / Regional Education Services Agencies will receive $25 million in state grants to purchase equipment and/or technology to improve the safety and security of school buildings, students and staff. This includes $47,824 for the Armada Area Schools. A complete list of award recipients is available here. Grant recipients have until Sept. 30, 2019, to spend their awards. 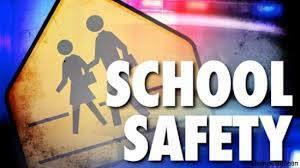 “The Competitive School Safety Grant Program will provide the resources needed by many schools throughout our state to ensure students have a safe learning environment,” said MSP Director Col. Kriste Kibbey Etue. “The review committee gave priority to proposals that sought to secure access points at school buildings, as it is considered one of the best and most cost-effective ways to improve school safety and security. The Armada Area Schools plans to use the funding to install enhanced door locks for classrooms, add ssecure keycard access to more entrances, install safety film on exterior windows, and to provide safety kits to each classroom. Armada Area Schools would like to introduce and welcome Tim Woelkers to the district. “Officer Tim” will be the new Director of Student Safety for the school district. Tim’s position is a direct result of last spring’s community safety forums where it was highly recommended that the school district have an armed resource officer employed in the district. Tim is an ideal fit for Armada Area Schools as he is a community member, had students attend our district, was a former police officer and school administrator, and has run our PAL camp for numerous years. It is the mission of the Armada Area School District to provide all students a dynamic learning environment in order to cultivate a mindset for academic excellence and social growth.